The second Thrush (MSC-204) was laid down as AMS-204 on 7 May 1954 at Tampa, Fla., by the Tampa Marine Co.; launched on 5 January 1955; sponsored by Mrs. Edgar S. Russell; redesignated MSC-204 on 7 February 1955; and commissioned on 8 November 1955, Lt. (jg.) Richard Anthony Dallamura in command. Late in November 1955, the new coastal minesweeper reported at Charleston for duty with Mine Division 42 and then conducted shakedown in Chesapeake Bay. In 1956, she moved to Yorktown, her new homeport; carried out assignments for the Mine Warfare School; and in August proceeded to Norfolk, her base for Operation "Hideaway." Early in 1957, she was assigned to the 6th Naval District and homeported at Key West. There she tested and evaluated new mine warfare equipment for the Mine Warfare Evaluation Detachment. In 1958 and 1959, she participated in mine warfare exercises out of Charleston and Norfolk, including NATO exercises. In August 1959, she again shifted home ports, this time to Coco Solo at the Atlantic entrance of the Panama Canal. She operated from that base until 1962 when she was ordered to Miami. There, she trained naval reserve crews for nine years. In 1971, she moved to Port Everglades, whence she continued her assignment with the Naval Reserve Force. At times, she served as a training ship for three reserve crews: two underway crews and an in-port maintenance unit—all elements of the Selected Reserve System. 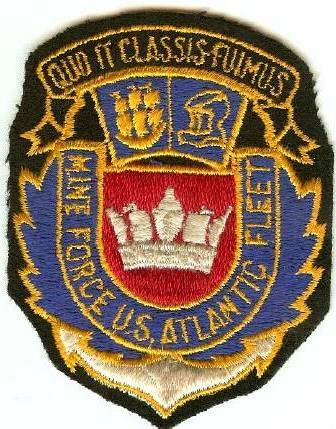 Conducting reserve cruises, visiting east coast ports, and ranging as far as the Bahamas for minesweeping exercises, she continued training Florida Reserves for the Mine Warfare Service, Atlantic Fleet, into 1975. In 1976, she was transferred to the Naval Oceanographic Office.